Through its new strategic partner, Applied Science Laboratories (ASL), Ascension now offers the best eye and head tracking system in the world. 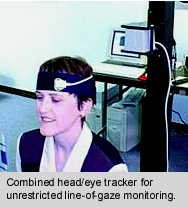 The highly developed, features-rich EYEHEAD™ system for use with head-mounted optics enables integration of eye and head position data -- thanks to DC magnetic tracking -- for real-time computation of eye-pointing angles. In short, an evaluator always knows where his subject is looking. By combining eye and head-tracking technologies, the evaluator can eliminate the need to reacquire the eye when the subject looks out of the tracking area and then returns. Eye fixation data is typically shown as a point-of-gaze cursor superimposed on a real-world object or computer graphics scene. Operator never has to manually aim pan/tilt module. Corrects for error by changing head position. Data unaffected by sudden head movements or subject looking away. Dimensions (HxWxD): 3" x 9.75" x 10.25"